Union, IL - The Illinois Railway Museum (“IRM”) is pleased to announce that it has acquired an Amtrak AEM-7 type electric locomotive built in 1982 in nearby La Grange, Illinois. 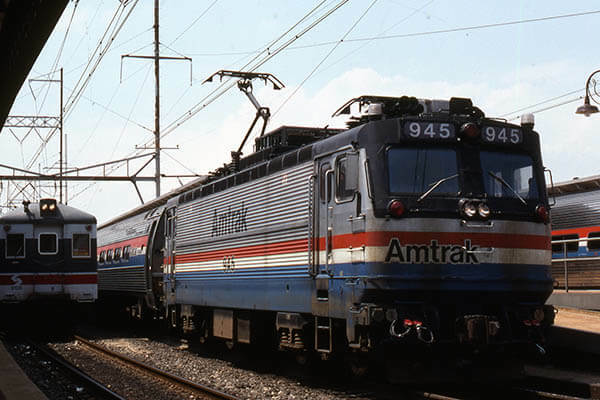 Amtrak number 945 is an AEM-7 electric passenger locomotive constructed specifically for operation on the “Northeast Corridor” route between Boston, New York, Philadelphia, and Washington DC. It was used in daily service on Amtrak’s busiest route for more than 30 years and was retired in 2015. The AEM-7 was the first successful passenger locomotive design used by Amtrak, which was created in 1971. The design was based on a Swedish locomotive which was imported in 1976 for testing. The AEM-7 was intended to be a general-use passenger locomotive on the Northeast Corridor and introduced high-horsepower, high-speed, lightweight European electric locomotive technology to the United States. It was capable of a top speed of 125 miles per hour, making it the fastest locomotive preserved at IRM. Number 945 was part of Amtrak’s second order for AEM-7 locomotives. It was ordered in 1980 and delivered in 1982, assembled in the historic La Grange plant of the Electro-Motive Division of General Motors. This and the other AEM-7 locomotives allowed Amtrak to retire its aging fleet of iconic GG-1 type electric locomotives inherited from the Pennsylvania Railroad. While some AEM-7 locomotives were rebuilt by Amtrak with newer AC traction motors, number 945 kept its original Swedish-built electrical equipment until retirement. This locomotive is the first locomotive acquired by IRM that was built for Amtrak and it is the youngest passenger locomotive in the museum’s collection. It was designed for operation on the high-voltage Northeast Corridor electrification system and, as it is not compatible with IRM’s 600-volt overhead wire system, is intended to be a static display piece at the museum’s site in Union. Number 945 joins an example of a GG-1 locomotive, the design the AEM-7 replaced, in the museum’s collection. About the Illinois Railway Museum:The Illinois Railway Museum, a “Museum in Motion,” is the largest museum of its kind in the United States. The museum was founded in 1953 and is located 35 miles northwest of O’Hare in Union, McHenry County. It encompasses all aspects of railway history including steam and diesel locomotives, electric streetcars and elevated cars, and historic passenger and freight cars which are operated on the museum's 150-acre site and 4.5-mile long railroad. The museum, a nonprofit educational organization, is owned and operated by volunteers and relies entirely on visitors and donors to fund its preservation efforts. For more information on the Museum and its special events scheduled throughout the year, visit www.irm.org.